Looking to start or spruce up your home gym? If you want a strong chest, shoulders and triceps you need to be doing dips. And to do dips, you’ll need a dip station. And durable enough to last you a lifetime. We’ve redacted a list of top 6 portable dip bars that fit the above criteria. Finding the best for you on your own can be a daunting task, so this article will give you all the information you need to decide on the perfect dip station. The Ultimate Body Press Dip Bar Fitness Station has a pass-through design that allows you to perform rows, is tall enough for users up to 6’5 and can support 350 lbs. The Black Mountain Dip Station can support 3000 lbs, over double of the second closest competitor. It also comes with a lifetime warranty and is easy to assemble and lightweight. 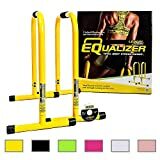 The Lebert Fitness Equalizer Bars take less space than the rest and come in two pieces, which means you can vary the width between to make exercises harder or target different muscle groups. 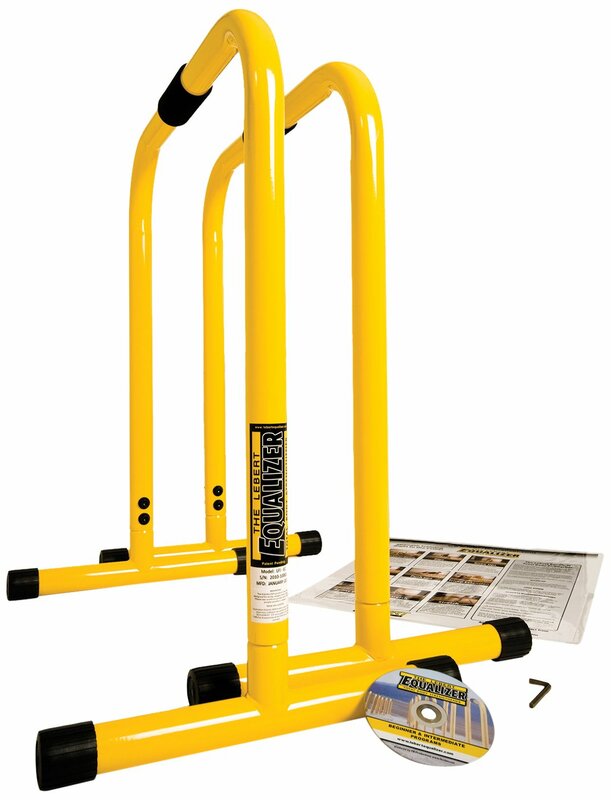 The Trademark Innovations Fitness Training Bar is a lightweight, portable piece of training equipment that is perfect for home use. The Titan Fitness Dip Station is made from heavy duty steel and finished with a tough powder-coated finish. It is built to last and can handle up to 750 lbs. The CoreX Functional Fitness Parallette Station is designed for increased stability and functionality. It has a wider base than those of its competitors. It allows for performance of multiple exercises, including dips, rows and push-ups. This one-piece dip bar is designed for tall people. At 6’ or more, it can be a struggle to find dip or pull-up bars that allow you to perform the movement without grazing the floor. You won’t have this problem on this one: it is 3 feet tall for users up to 6’5. The pass-through design also allows for full bodyweight rows so that you can balance the development of your chest and back. It is easy to assemble (only takes two minutes to put it together or take it apart) and although it may appear unstable at first glance, it actually becomes more stable as you put more weight on it. It weighs 18.5 pounds and can hold up to 350 lbs, which will be enough for you and for additional weight if you’ll need it. The value well justifies the price; I would especially recommend this one to taller folks. The sturdiest on the market, the Black Mountain Dip Station allows for loads up to 3000 lbs. In other words, there is no way you’ll ever break this thing, which the manufacturer emphasizes with their lifetime warranty. Despite the strength of the one-piece build, it comes in at just 18.4 pounds, still making it one of the lighter bars on the market. The distance between the bars is 22 inches and they stand 27 inches tall, making it tall enough even for most people above 6’. However, the width might be too much for people with narrower shoulders, so keep that in mind when making your decision. The set will not wobble when you are doing exercises on it. If you are looking for a dip station that will last you a long time and won’t break even after adding 3 or 4 45 lbs plates to your waist, this one should be at the top of your shortlist. 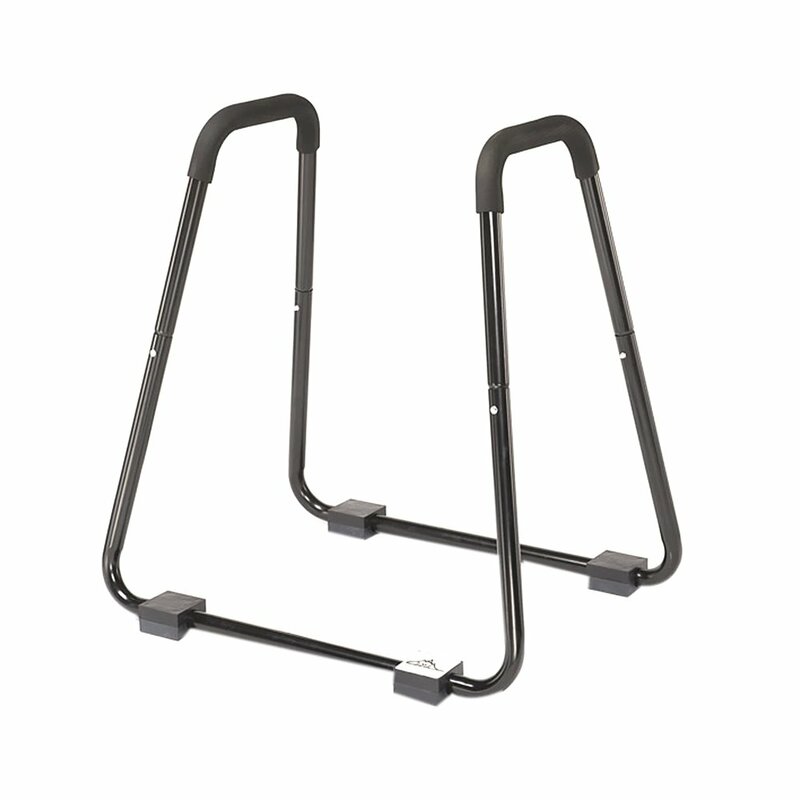 The Lebert Dip Bars come in two pieces, which makes them much more adaptable to different builds and exercises. Each bar weighs 8 pounds and it has been tested to 400 lbs. The versatility is their strong point: unlike fixed bars, you can move these around and get creative with angles and spacing. This also makes it very easy to store them, as they don’t take up as much space as fixed bars, even when they are assembled! This adds to the ease of use. However, it also makes them less stable than some of the other bars. You might have to put some weight on the legs to keep them in place. 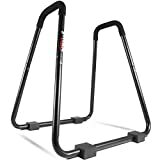 Its height – 28 inches – also doesn’t make them ideal for tall people, who would be better off with the Ultimate Body Press Dip Bar Fitness Station despite its one-piece design. But if you are a short person and have something to weigh these down lying around, these are absolutely worth the money. The Trademark Innovations Dip Station is a lightweight (17.5 pounds), portable bar. The width between the bars is 17 inches, which will be the ideal width for most people. The assembly takes quite a while and it can’t be dismantled very quickly either. All the parts are held together by bolts. This does make it more sturdy, but also impractical if you have to disassemble it after each use. 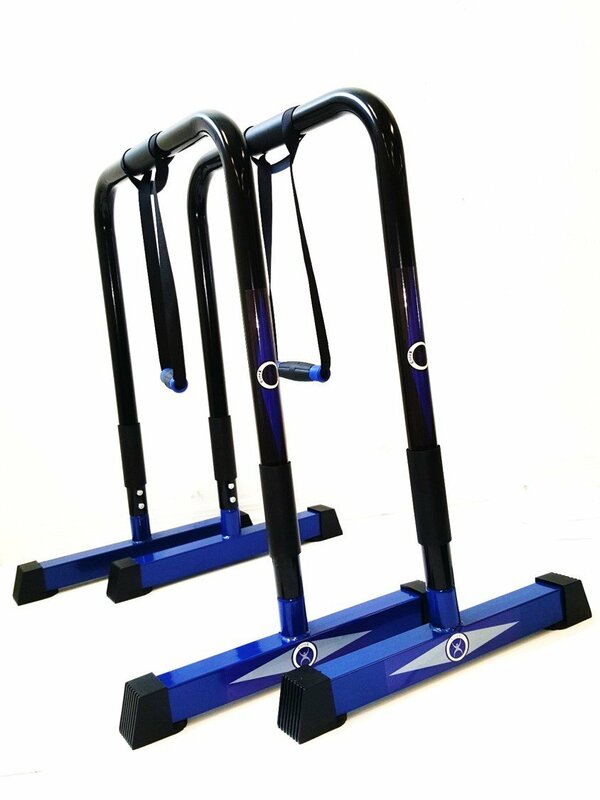 It comes with additional bands and handles that you can attach to the bars and use for push-ups. It costs a bit less than most of the competitors and while this might be called the “budget choice”, it is not less sturdy or stable. You can also use a weight belt on it, but the weights will have to be close to your body or they will hit the floor. A weighted vest is another good option when the resistance of your body weight becomes too little. All in all, I would recommend this one if you are not particularly tall and have enough place to store it. With an extra wide base, the Titan Fitness Dip Station is hard to tip. 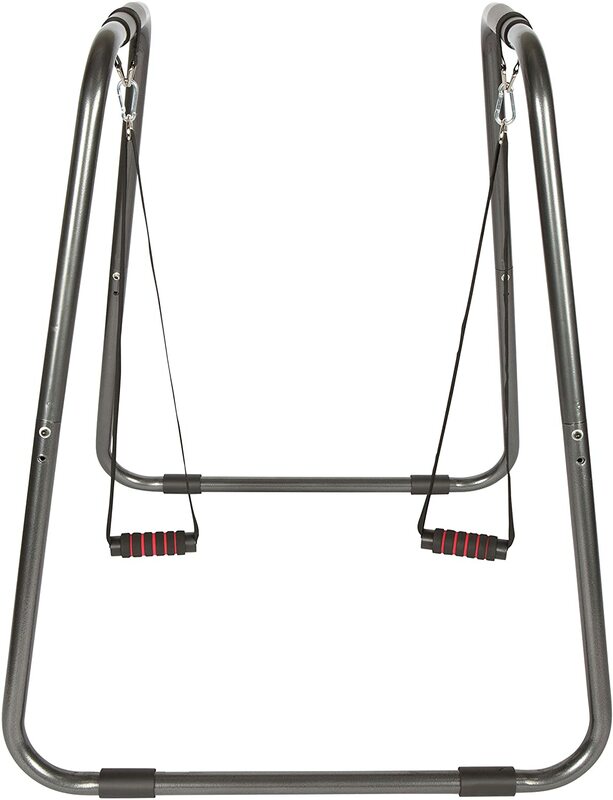 As such, it can even be used for explosive and plyometric exercises like leg swings and swinging dips, which most other bars can’t handle. Combined with the fact that it is good for 750 lbs makes it a very sturdy and durable dip station. It is made out of heavy duty steel with a height of 39’’, while the distance between bars is 20’’. The grip on the bars is made out of foam to prevent calluses and other hand problems. At 19 pounds it is just a tad bit heavier than some other bars, but still light enough to make it easily portable. The assembly takes a few minutes, but not to long, unless you want to savour the moment. 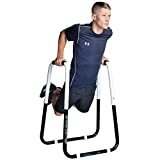 At the end of the day, I would recommend these to people who are more advanced in their body weight training so that they can do swinging or Russian dips at a great price-to-value ratio. The CoreX Parallette Station is a two-part piece of home gym equipment. 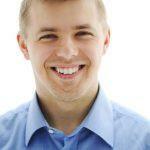 However, they stand out from other double bars with their emphasis on stability. Their “feet” are wider and each bar weighs 13 pounds (typical bar weight is 8 lbs), making them much more stable, which is always a concern with something that is not made from one piece. These pass with flying colors. They give you the freedom to play with different positioning while being stable enough without additional support. They are 34 inches tall, placing them among the tallest on the market. With the fact that they can support up to 450 lbs, they are ideal for taller, heavier people. Due to the height, adding a dip belt should be no problem. The only problem with them is the rubber smell on the feet, but that will go quickly go away. 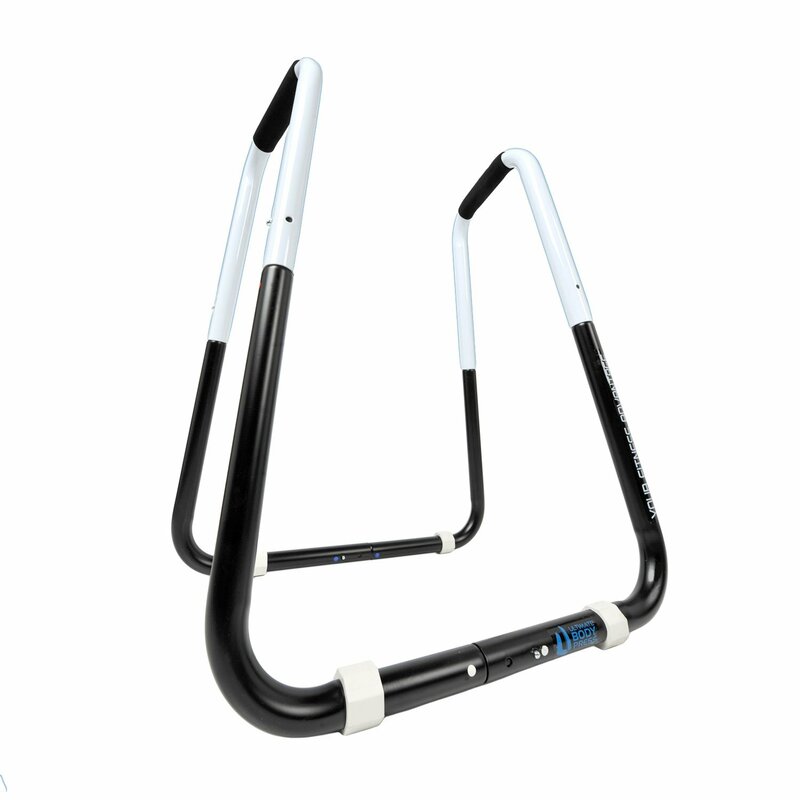 These bars combine stability with adaptability and are well worth the slightly higher price tag. 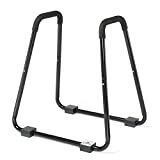 If you are looking for a set of bars that is easy to use and store and offers a large degree of adaptability and creativity while being sturdy enough to last a lifetime, this pair is for you. Now when you have a dip bar picked out, I know that you will be anxious to try it out: so here are some ideas you can implement in your training. As far as the exercise selection goes, you’ll want to do a few of them. First off, dips. Why should you do dips? Obviously, they are the best beginner bodyweight only exercise after push-ups. Next up, to balance the front and back development, you will do inverted rows. These two will be the bulk of your training. After that, we’ll add the leg/knee raises or L-sit to work your core and you’ll have a well-rounded workout for upper body development. As you progress and get stronger, you’ll add more advanced exercises, but this will be a good start. Here’s how you can program a quick and effective workout plan using your dip bar. All exercises will be done in supersets. For each exercise, do as many reps as you can do minus two. So if you can do 10 dips, do 8. The L-sit is done for time. Do five seconds less than your best hold time. If you find the version with both legs extended too hard, just extend one or bend them at the knees. Repeat for five rounds with 1 minute rest between. If you want to add some lower body work like squats, feel free to do so. I know it looks simple, but after five rounds, you’ll be down to just a few reps on each exercise. Don’t forget to keep the proper form for all the exercises to get the most out of your training. There are so many dip bars, but there can only be one winner. And that is the CoreX Functional Fitness Parallette Station. Tall enough for 6’4’’+ people? Check. Stable enough to make you confident on it? Check. 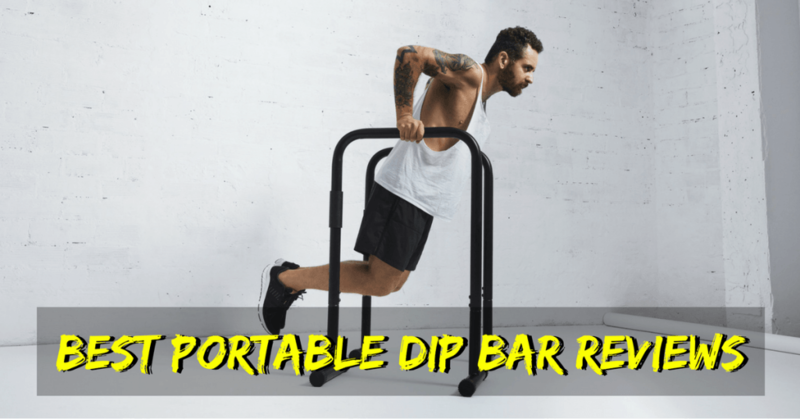 The CoreX bar covers all the needs that a home gym dip station has to have. For the price of one or two gym memberships, you can have a piece of equipment that will last you a lifetime of training, no matter how advanced you become.